Sun Dogs, known scientifically as parahelia, are optical phenomena characterized by bright spots directly to the right and to the left of the sun. 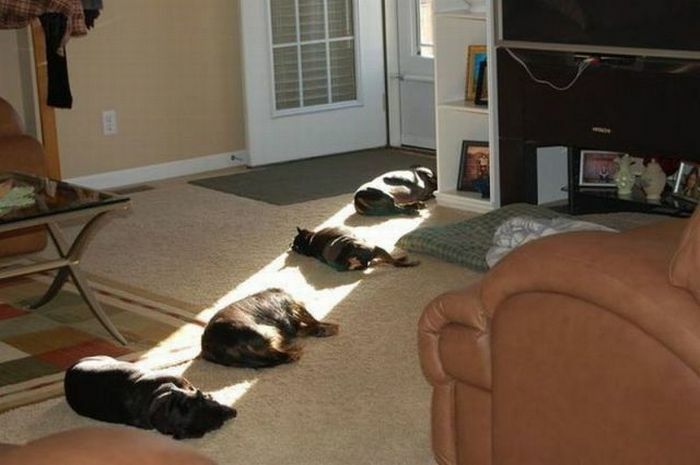 Although the name is supposedly a mistranslation of an Inuit term referring to “the sun’s dogs,” sun dogs can be seen anywhere in the world, at any time of the year, though are most often visible when the sun is at or near the horizon. 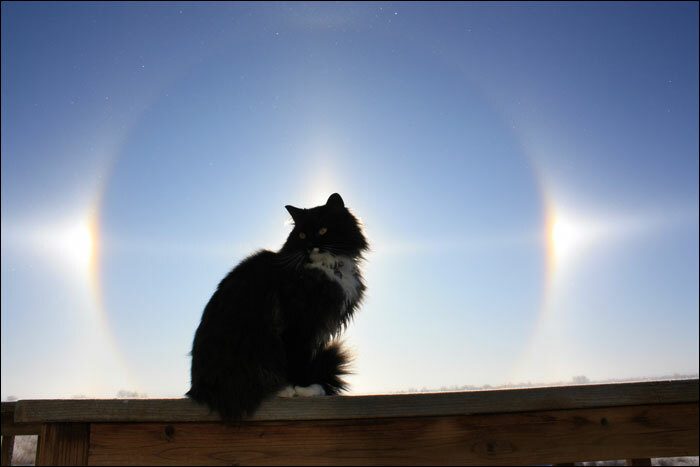 This has to do with the underlying cause of sun dogs: hexagonal ice crystals in cirrus clouds and ground-level “Diamond Dust” which forms at exceptionally low temperatures. As these ice crystals drift downwards they do so parallel to the ground, creating the perfect prism through which to refract a sun at or near the horizon. Due to the specific optical properties of ice crystals, sun dogs are always located 22° away from the sun, and may be accompanied by a 22° halo, which occurs when enough ice crystals “wobble” from their parallel-to-the-ground orientation. Sun dogs have a long history in art, literature, and religion — as both a source of trepidation and inspiration — with references dating back to Aristotle, Cicero, and Seneca before the common era. Shakespeare mentioned them in Henry VI. Someone in 1535 Sweden dramatically depicted them very dramatically. And they’re still a source of conspiracy theories in modern times.